NF Railway has introduced”Clean my coach” a SMS based cleaning service in 35 pairs of trains, stated in a press release of NF Raiwlay. According to the Railway authority this will help passenger of the nominated trains to get the coach attended by on board housekeeping staff (OBHS) immediately by just sending a SMS. The facility is available between 06-00 am to 10-00 pm. For availing this facility the passenger has to send a SMS as CLEAN<space>10 digit PNR no to 58888 or enter the PNR no at www.cleanmycoach.com. On receiving the information from running train, SMS will automatically generated to the OBHS supervisor, to the control office and the passenger. Cleaning staff will be deputed immediately and after attending the request, feedback code will be collected from the passenger. The control office will monitor the request and if not attended; reminder will be send to the OBHS supervisor. The OBHS supervisor will then send the feedback code collected from the passenger to 9200003232 followed by a keyword. cleanmycoaach.com will then close the request with time stamp only after validating the feedback code and mobile number from the concerned passenger. 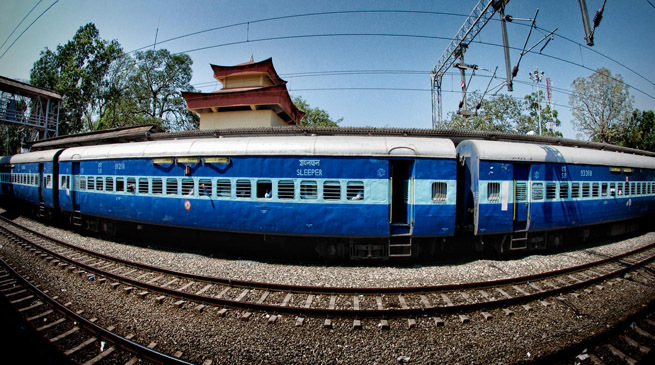 At present the service is available in the Poorvottar Sampark Kranti Express, Northeast Express, Guwahati – Ernakulam Express, Guwahati – Bengaluru Cantt. Express, Guwahati – Secunderabad Express, Guwahati – Trivandrum Express, Garib Rath Express, Jan Shatabdi Express, Kamakhya – Anand Vihar Express, Guwahati – Chennai Egmore Express, Guwahati – Bermer/Bikaner Express, Dwarka Express, Guwahati – Puri Express, Guwahati – LTT(via Katihar) Express, Guwahati – LTT(via Malda Town) Express, Lohit Express, Amarnath Express, Kanchanjungha Express, Kamakhya – Gaya Express, Kamakhya – Gandhidham Express, Kamakhya – Puri Express, Kamakhya – Ranchi Express, Kamakhya – Anand Vihar AC special, Kamakhya – Yesvantpur AC Express, Kamakhya – LTT AC Express, Kamakhya – LTT Karmabhoomi Express, Dibrugarh – Bengaluru Express, Dibrugarh – Chandigarh Express, Dibrugarh – Chennai Egmore Express, Dibrugarh – Amritsar Express, Dibrugarh – Howrah Kamrup Express, Dibrugarh – Kolkata Express, Dibrugarh – Kanniyakumari Express, Dibrugarh – Jhajha Express, Tinsukia – Lalgarh Avadh Assam Express. Railway authorities requested to the Passengers to avail the newly introduced facility. This is yet another initiative undertaken by N.F.Railway for extending improved services to the passengers where prompt attention is sought to be extended on cleanliness matters.